Did you receive a gorgeous vintage engagement ring during your proposal? Or was it a sleek, modern and contemporary ring? Whatever the case, Randor can help you find the perfect wedding band to complement your engagement ring. These two rings should sit in harmony along your finger for the years to come. Here are some tips to consider when choosing the right wedding band. If you have a solitaire design wedding ring with a princess, round or emerald diamond, avoid matching the ring and opt for a band that will bring out its best features: the diamond. This style is one of the easiest to work with because it has one main attraction! Our Pavé set diamond wedding ring could be an excellent choice in this scenario. It features a set of three rows of round cut brilliant diamonds on an 18kt white gold band. This would add a little texture and shine to the duo without taking away from the bauble. Our Bezel-Set Band made of 18kt white gold could also be a great option for a solitaire ring or even for a bezel-set diamond engagement ring. Its unique use of shape between round cut and princess cut diamonds makes it the perfect addition to add texture or flare to simpler wedding rings or to support larger unique standout pieces. If your engagement ring is quite decorative, you might want to opt for a wedding band that has more solid features to strike a nice balance! Our Channel-Set wedding ring is a solid 18kt white gold ring that features seven round diamonds in a channel. We can also custom design your wedding ring for you. This is a great option if you have an engagement ring that has specific requirements. We will examine its features, curvature and how it sits on your finger and design a wedding band with your needs in mind. If you prefer to talk to somebody before coming in to our store, ask us your questions to get the process started! You can show your love towards another person in many ways – through body language, gestures, and even by scheduling some quality time to do things together. It’s even sweeter when a little extra something is thrown in – like a precious gift. Randor has a great selection of beautifully crafted jewellery pieces that make excellent gifts for any occasion. Whether you’re celebrating a milestone together or simply want to show your appreciation, you’ll be sure to find something here. Here are a few jewellery pieces perfect for gift-giving. This gorgeous pair of stud earrings is perfect for any occasion, from daily wear to more formal applications. The round brilliant cut diamond earrings come with a removable halo offering versatility for different looks. For a simple application the halo can be removed. For a more vintage-inspired flair, leave them be! These are also available in 18kt White Gold. This is a true and unique beauty. It offers texture, colour, brightness and contrast to catch the eye. The scalloped circular diamonds and blue sapphires are set elegantly along the 18kt white gold framing. This is a great go-to piece for formal occasions. It’s sure to start a few conversations! The allure of beauty is also found in simplicity. This is what this piece is all about. This bracelet showcases stunning bezel-set round brilliant cut diamonds with mill-grained bezels. It’s perfect for everyday wear or to add a romantic air to an evening look. This is available in 14kt and 18kt White or Yellow gold. Giving the gift of a precious ring doesn’t always have to be associated with a formal engagement. Whether you are married or you’re still in the earlier stages of your relationship, giving the gift of a ring is a wonderful gesture. 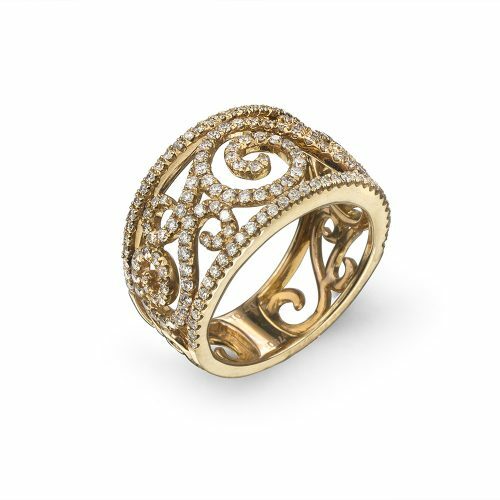 This Pink Gold Filigree Diamond Ring emanates warmth through its golden hues. It has a romantic feel that comes from the vintage-inspired design, and the set diamonds add the just right amount of embellishment! Contact us today to speak to one of our jewellery experts.